When I married my husband, he had horribly cracked heels. Apparently, he’d had these most of his life, but as we learned more about natural living, I set out to find natural remedies for it. In the summertime especially, when feet are more exposed (hopefully barefoot or in minimalist shoes), cracked heels can be a problem. Beyond appearance, cracked heels can be really uncomfortable and can mean anything from minor discomfort to pain and bleeding. My husband and I met walking across the country (true story!) and cracked heels (let alone blisters, shin splints, and other ailments) were our constant companions, so we have a little experience with this. It’s not something we think about every day, but feet do need special care just like other parts of our body… if not more, because they work harder! Let’s see how to size up the situation. Since cracked heels have a variety of causes, it is important to find the root of the problem. The condition of skin often reflect internal health (or problems). Deficiencies of zinc, magnesium, and omega-3 can contribute to chronically cracked heels. I’ve seen this condition improve with dietary changes, such as adding fat-soluble vitamins and getting gelatin in the diet. Personally, we take omega-3 supplements daily and make it a point to consume wild-caught fish to maintain omega-3 levels. Since zinc is important for men’s health, my husband also takes a zinc supplement regularly. Externally, cracked heel causes can include skin conditions or fungal infections. Often these can be helped with regular detoxifying foot soaks or a concentrated salve. As a general rule, I suggest trying any remedy for at least a few weeks to see if it is working. For best results, try external and internal approaches at the same time. Pour 2 tablespoons of boiling water into the magnesium flakes in a small container and stir until dissolved. This will create a thick liquid. Set aside to cool. Set a quart-size mason jar inside a small pan with 1 inch of water. Add the coconut oil, beeswax, and shea butter to the jar. Melt slowly over medium heat, stirring occasionally. When melted, remove the jar from the pan and let the mixture cool until room temperature and slightly opaque. At this point, put into a medium bowl or into a blender. Slowly (starting with a drop at a time) add the dissolved magnesium mixture to the oil mixture while continuing to blend. Continue until all of the magnesium mix is added and it is well mixed. Add the oregano and peppermint essential oils (if using) and whip until combined. Store in fridge for best consistency (and a cooling lotion feel), or at room temperature for up to two months. 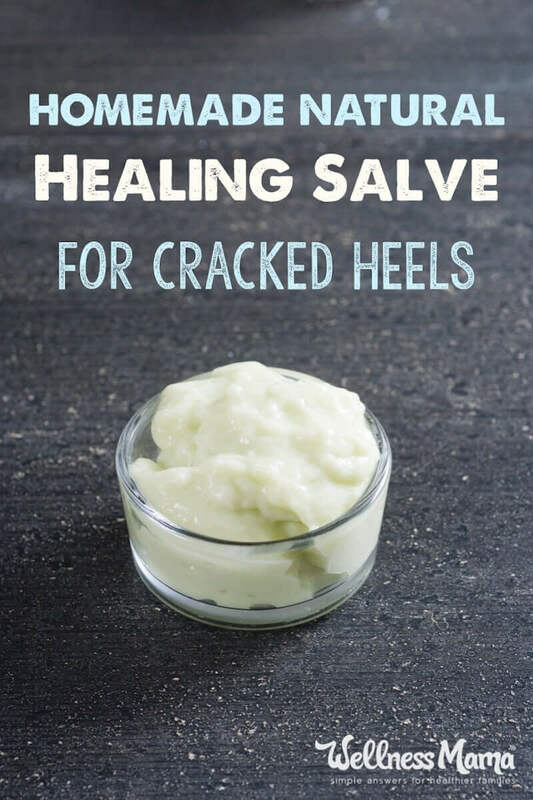 Apply the salve to cracked heels at night. Exfoliate feet while dry, using the pumice or Ped Egg. Do a detoxifying foot soak. Let skin dry fully. Apply a thick coat of salve. Wear socks to bed to keep salve where it’s needed (and to keep sheets clean). Repeat as needed until problem resolves! Note: Do not use oregano or peppermint essential oils on children or while pregnant. As with any medical condition, check with a doctor if things don’t improve or if you have any specific concerns. That’s it! Show your nails some TLC and you have a pair of beautiful and healthy feet ready for summer! Do you have cracked heels? What natural remedies have you tried? Share below!